The Ranfurly Shield is back in Canterbury! The Log o’ Wood is home! 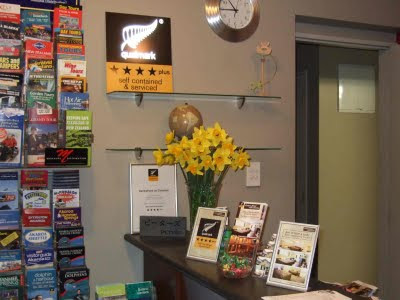 The Ranfurly Shield, also referred to as the Logo’ Wood and regarded as the greatest prize in New Zealand provincial rugby, is back in Canterbury! Our team beat Wellington 36 -14 to bring the Log o’ Wood home after a break of 2 years. 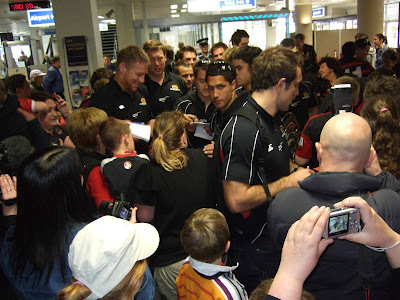 We went to Christchurch airport to congratulate our boys on a job well done (see photos and TV3 news clip) and got hold of the Shield for a while. 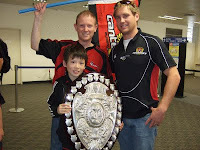 Now it’s our boy’s job to keep the Shield in Canterbury for as long as possible. The first defence of the shield at AMI Stadium is against Otago on Sat. 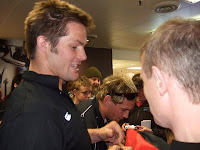 12 Sept. followed by Taranaki on Fri. 18 Sept., Northland on Sat. 26 Sept. Manawatu on Fri 9 Oct. and finally against Southland on Thu. 22 Oct.
AMI Stadium is easy to get to from CentrePoint on Colombo Motel using either the Free Shuttle (approx 30 mins) or taxi (approx 10 mins) and after the game it’s just a short walk back into town to celebrate another Canterbury victory! Book online to ensure your room to support either Canterbury or your own team! Daffodils from the Cancer Society arrived yesterday just in time for Daffodil day on the 28th. The warm weather in Christchurch means they have all bloomed already! CentrePoint on Colombo Motel is a proud sponsor of the Japanese movie "VELVET ~Surfing Journey in New Zealand Moa 2~. which was been released on DVD in Japan in July. It follows on from Moa 1, the hit surfing journey around the North Island released the year before. Moa 2 is based around a journey of Japanese and American surfers in the South Island. The film crew and surfers stayed here at CentrePoint on Colombo Motel while they surfed and filmed at Magnet Bay, Taylors Mistake and Brighton.